Dr. Rosemarie Rossetti (20+ years exp.) shares her strategies for embracing change, improving performance & achieving personal goals through tenacity, resilience, & conviction. Customized results-oriented programs delivered to Fortune 500 companies. A powerful, internationally known speaker and trainer who walks her talk! On a bicycle ride, Rossetti’s life was transformed when a 3 1/2 ton tree came crashing down on her leaving her paralyzed from the waist down. In her motivational keynotes, she shares the lessons learned since that fateful day and demonstrates how to manage change, stress, and work-life balance. Rossetti is a recognized role model and agent for change. 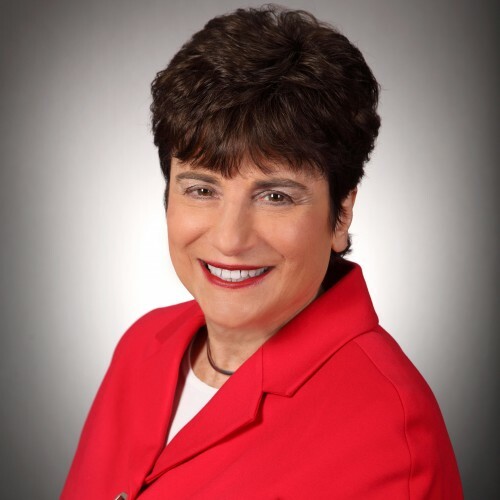 She has been a full-time professional speaker and trainer since 1997 with a proven success record in corporate and organization settings, speaking to groups from 10 to 10,000. Rossetti customizes program geared to achieving her client’s desired outcomes with enterprise-wide satisfaction and measurable success. Rossetti uses her five Lessons to Live By, learned during her recovery, to revitalize and recharge her audience. She taps into what motivates people to change their behavior, awaken their inner gifts, and find meaning in their lives. As a recognized industry expert, rather than lecture, Rosemarie inspires participants to bring out the best in themselves through developing tenacity, perseverance, and resilience. She encourages taking advantage of opportunities following adversities so audience members can accomplish more with greater confidence. "Universal Design Toolkit: Time-saving ideas, resources, solutions, and guidance for making homes accessible" The Ultimate Resource for Aging in Place With Dignity and Grace! Are you looking for housing options that are safer and more accommodating for independently aging in place? Do you want to enjoy comfort, accessibility, safety and peace of mind – despite your disabilities, limitations and health challenges? The help you need is available in the Universal Design Toolkit: Time-saving ideas, resources, solutions, and guidance for making homes accessible. This is the ultimate resource for individuals and professionals who want to save time, money and energy when designing, building, remodeling or downsizing a home. The Universal Design Toolkit will help you take the steps to design homes for your clients or yourself while eliminating the costly trial and error challenges you’d inevitably encounter if faced with this learning curve on your own. Rosemarie Rossetti, Ph.D., teamed with her husband Mark Leder in creating this unique Toolkit. They bring ten years of research, design and building expertise by serving as the general contractors for their home, the Universal Design Living Laboratory – which is the highest rated universal design home in North America. Within the Toolkit’s 200 richly illustrated pages, you’ll find: • Insights that distinguish essential products, services and resources from the unnecessary. • Proven, realistic tips for finding the right home. • Home features you need to look for. Nothing is assumed or left out. • Handy home checklists and assessments. • Interview questions to help you hire industry professionals with knowledge and experience. • Photographs that provide a frame of reference to inspire, clarify and illuminate features and benefits. • Valuable resources to save you time, money and energy. • Helpful sources of funding. • Space planning dimensions for access using assistive devices such as wheelchairs and walkers. • And so much more! If you want useful, dependable advice and easy to implement ideas from respected experts who know the ropes, you’ll love Rossetti and Leder’s perspective. As a speaker, author and consultant who uses a wheelchair, Rossetti has helped hundreds of people design their ideal homes. Now her comprehensive Toolkit is available to help and support you! Get the Universal Design Toolkit now to start your project! "Take Back Your Life: Regaining Your Footing After Life Throws You a Curve" Having the courage to face life after life throws you a curve ball is difficult at the best of times. But when life throws a 3 1/2 ton tree on top of you and places you in a wheelchair, you barely have the strength to survive. Paralyzed from the waist down, Rosemarie Rossetti reached the depths of pain and despair. During the first weeks of rehabilitation she struggled to get her life back. Through her persistence and dogged determination, she learned many lessons that she has turned into rules to live by. "Take Back Your Life!" is a collection of 20 syndicated articles that affirms the life lessons that Rosemarie has mastered and now shares with others. Each chapter of the book takes the reader through a phase of Rosemarie's development. This book demonstrates how to survive and thrive. Rosemarie's engaging first person style of writing immerses the reader in her struggle to regain her independence. By using her real-life examples and her insightful nature, readers quickly understand how each lesson can be adapted to their own life. You'll find yourself laughing, crying, and growing as you discover how you too, can live each day to its fullest. "Life is too short to spend it being unhappy," said Rossetti. In nature where there is balance there is harmony. Through her "wheel of life" Rosemarie shows how people can get "caught up" in one part of their life and neglect the fun that life has to offer. "Take Back Your Life!" gives ideas on how you can analyze the segments of your "wheel of life" that need attention. Learning how to keep your wheel in balance will give you the get-up-and-go, the energy, and the enthusiasm for life that you never had before. "If I was placed in similar circumstances I don't know how I could've survived," one reader says. "But now that I've read the book, I know that I can conquer the obstacles that I face every day." Another reader said, "Rosemarie's words of courage and optimism will remain with you long after you've finished this inspiring book." Rosemarie Rossetti's powerful story will change your life, too! "The Healthy Indoor Plant: A Guide to Successful Indoor Gardening" Classical teaching in horticulture generally is based on the needs of outdoor or greenhouse plants, an approach not necessarily appropriate to maintaining healthy plants indoors. The groundbreaking information contained in The Healthy Indoor Plant satisfies the need for a volume devoted entirely to indoor ornamental horticulture. This comprehensive, profusely illustrated volume uses a holistic approach to provide accessible information about the healthy management of plants being kept indoors for long periods of time. The authors show how the various aspects of plant care are interrelated. Plant care requires attention to and knowing about the interaction of the plant and its environment and understanding the relation between the plant, its parts, and their functions. Outstanding features: offers clearly written and well organized descriptions; includes chapters on the makeup of a plant and the processes going on within plants; includes encyclopedia of common indoor plants for useful reference; contains a table of conversion factors valuable in many contexts; provides a comprehensive glossary of terms. Find out more about Rosemarie Rossetti, Ph.D. at https://www.rosemariespeaks.com.